We are officially sold out for the 2018 season. Our sincerest gratitude to our faithful volunteers & customers, for the blessing of another year of education. Hallelujah! 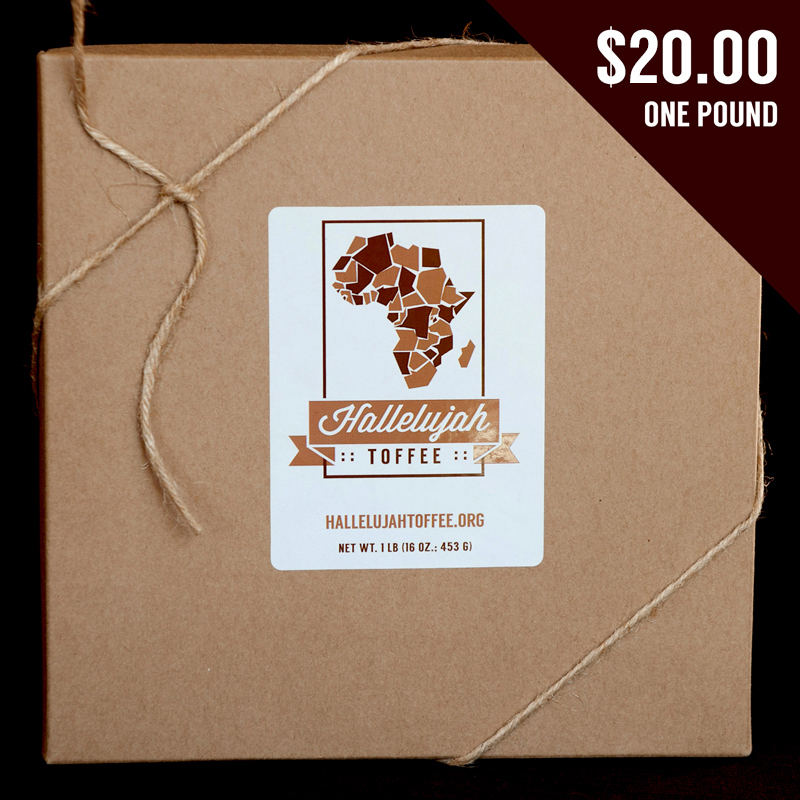 Our one-pound standard box of Hallelujah Toffee is our most popular gift at the holidays. Each pound is stirred by hand, delicately draped in milk chocolate and roasted almonds, and bundled snugly into our airtight packages. Our half-pound of Hallelujah Toffee is delicately stirred, hand-poured, and topped with decadent milk chocolate and roasted almonds. Then, it is tucked into a sturdy box in a fully sealed package to guarantee lasting freshness. TWO: to take every opportunity to share the story of God’s adoption of them, and us. 100% of our profits go directly to well-deserving students from the slums of Kenya, each with their own personal story of difficult circumstances and even stronger resolve. Affectionately referred to as our “Candy Kids,” these secondary students are now receiving a full year of education, room and board, mentoring, an emergency medical fund, and summer camp experiences during their holiday months. With over 100 students now in the Bridge Ministries program and forty of those fully funded by Hallelujah Toffee, we are excited to see each year’s students moving closer and closer to fulfilling their dream of obtaining a high school diploma. These students rank in the top 5% nationally, despite facing dismal circumstances. Most of these students have grown up as orphans, young heads of households, or with a single surviving parent or relative.Whether living in the slums in the city or rural villages far from the bustle of city life, all of them have fought adversity and intense poverty. As we all know, it’s trials that seem to bring out true character, and our students reveal hearts that are living for Someone other than themselves. We now have three classes of high school graduates, and you can imagine our delight. As our older students move closer to finishing high school, our younger students are just beginning. As God provides funds, we partner with Bridge Ministries to finance the following year’s various tuitions in addition to adding new students to the program each year. 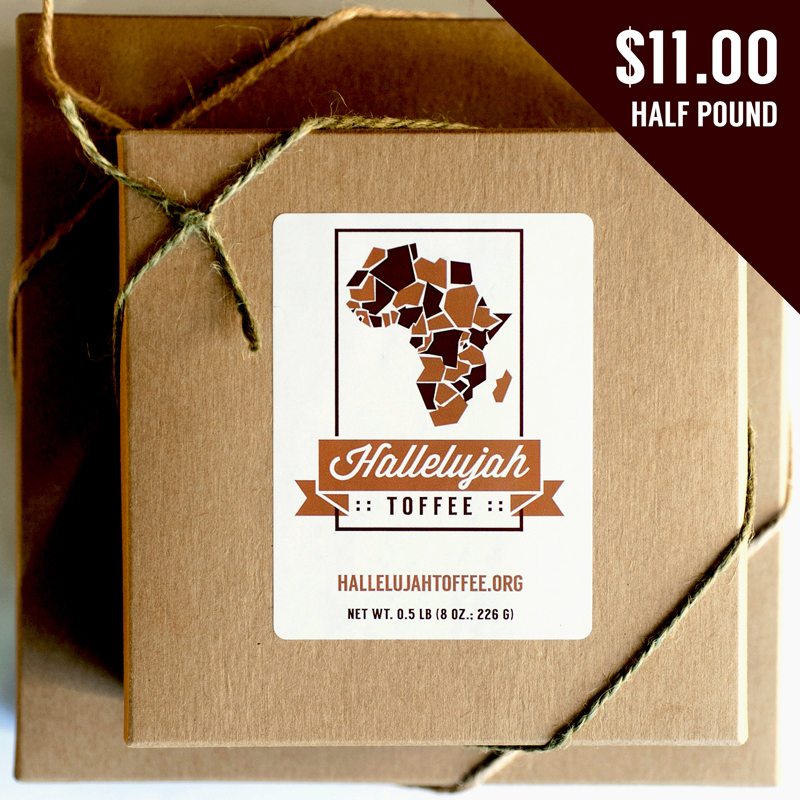 Comprised of an all-volunteer staff, Hallelujah Toffee vows to dedicate countless summer and autumn hours to its mutually held passions – God, His love for the orphans, and education. Amazingly, we meet all of these goals with rich, nutty toffee! In 2018, this homegrown candy company delicately stirred over 4,500 pounds of buttery, handmade goodness. And this year, we have already hand-stirred, hand-poured, and hand-packaged two and a half tons of toffee! We are excited to continue watching the response this year. McQueen Craft Faire, located at McQueen High School, Reno, Nevada, on October 19th (5-9 p.m., adults only), October 20th (10 a.m.-5 p.m.), and October 21st (10 a.m. – 4 p.m.). Young at Heart Annual Holiday Craft Fair, located at the Douglas County Community Center (1320 Waterloo Avenue, Gardnerville, NV 89410). Unfortunately we are unable to attend, we hope you enjoy the fair. You can find our toffee at Joyce’s Jewelry and Carson High School. Carson High School Holiday Craft Fair, located at Carson High School, 1111 N. Saliman Road, Carson City, NV. Friday, November 16 (5 – 8 p.m.) and Saturday, November 17 (9 a.m. – 4 p.m.). How to get yourself some toffee! If you are local to Northern Nevada, you can give us a call at 775-265-3390 or email hallelujahtoffee@gmail.com, to avoid shipping costs. If your order requires shipping, we ship every day until we sell out. If you choose to, you can give us the words you’d like us to hand-write into a Christmas note which will be included in your package(s). We are happy to work in the elf shop, so there are no processing or handling fees.